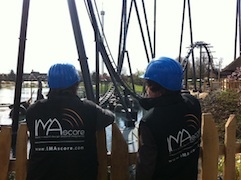 The team of IMAscore was at the Heide Park Resort for last adjustments of “Krake’s” soundtrack. From now on the whole area of Germany’s first Dive Coaster will be filled with atmospheric sounds full of threatening moments and scary melodies. 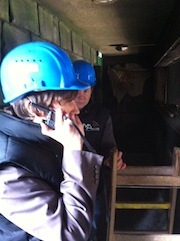 Finally we are reaching the end of the international project. During several months of production we created over 80 minutes of music- and sound-atmospheres. After successfully setting the volume levels on site, the park and we were able to create a sound experience that matches perfectly. On this saturday the 16th, the new major attraction 2011 of northern Germany’s biggest amusement park opens and with it a whole new themed part of the “Pirate’s Bay”-area. Maybe we will meet you on the opening day of the Krake at the Heide Park – the team of IMAscore will be on site! We invite you to be our friends – visit us on Facebook!